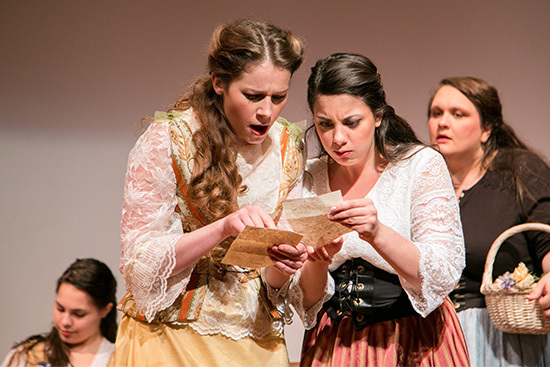 Samford University opera students earned 2nd place in the final round of the National Opera Association’s 2015 Collegiate Opera Scenes Competition on Jan. 8 in Greensboro, North Carolina. Samford was selected to compete against 11 schools from across the nation in a live performance at the NOA’s national convention after advancing past the preliminary round. Seniors Abi Benke and Lauren Marino, junior Christy Vest and graduate student Maggie Gill all competed in the undergraduate opera division with Giuseppe Verdi's "Letter Quartet" from his opera “Falstaff.” During the comedic scene, best friends Alice Ford (played by Benke) and Meg Page (Marino) receive identical love letters from Sir John Falstaff, a vain, boastful and greedy knight. With the help of Nannetta (Vest) and Mistress Quickly (Gill), the women resolve to punish Falstaff for his deception. The students performed the quartet in Italian. "Samford Opera students delighted the audience with their performance at the [competition],” said Kristin Kenning, assistant professor of music and Samford Opera director. “Their level of commitment to the music and characters of this comedic quartet paid off in the precision of their ensemble singing, and the crackle of their energy and movement on stage. I couldn't be prouder of their preparation, performance, and teamwork, or more thankful that they were given this opportunity to shine."